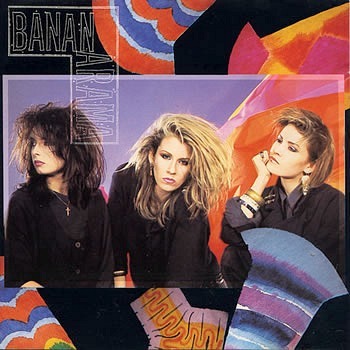 This page is dedicated to the British girl group Bananarama, who are best remembered for their eighties hits inc. Venus, Robert De Niro's Waiting, Na Na Hey Hey Kiss Him Goodbye, and their early hits with Fun Boy Three, of course. In fact, the girls notched up a total of ten Top 10 hits during the 1980s. The video playlist above features all of the girls' chart hits in chronological order, with exception of their first ever release Aie A Mwana and Cruel Summer '89, both of which weren't available. All of these songs charted in the British Top 100. Released on 28th January 1983, Deep Sea Skiving was the girls debut album, reaching #7 in the UK and achieving Silver. The CD reissue includes an extra disc containing 16 bonus tracks. 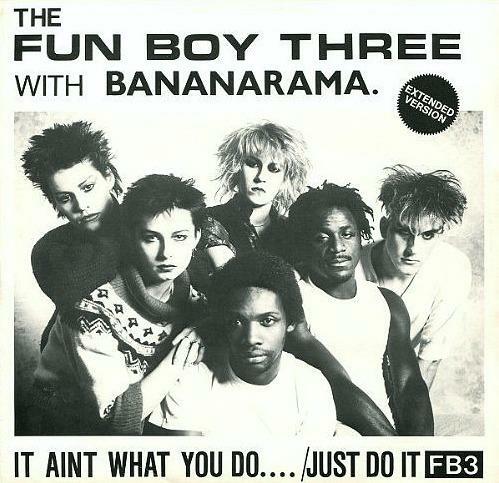 "IT AIN'T WHAT YOU DO IT'S THE WAY THAT YOU DO IT"
This was the very first chart hit for Bananarama, on which they teamed up with 80s Band Fun Boy Three. The band featured three ex-members of The Specials; Terry Hall, Neville Staple and Lynval Golding. The trio had ditched the moody, darker sound of their previous material and replaced it with a brighter, poppier one. It Ain't What You Do... reached #4 in 1982 and was the second single from the Fun Boy Three's self-titled debut album. The next single release, Really Saying Something, was also with Fun Boy Three but featured on Bananarama's album Deep Sea Skiving. Fun Boy Three released two albums, the self-titled Fun Boy Three which reached #7 in the UK album charts and Waiting which reached #14. They also had seven Top 20 singles during the early 80s, between 1981 and 1983. 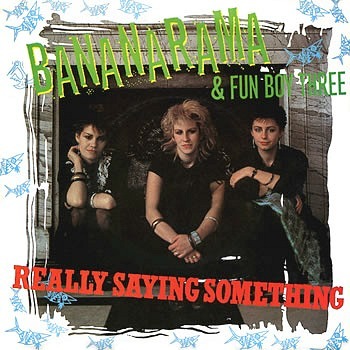 THE FUN BOY THREE WITH BANANARAMA "REALLY SAYING SOMETHING"
"Bop bop shoobee do ah-ah". Yes, released in April 1982, this cover of the 1964 Motown song by the Velvetettes reached #5 in the UK. It was the second consecutive collaboration with Fun Boy Three. The intriguingly-titled B-side, Give Us Back Our Cheap Fares, was included on the 2007 reissue of the album. This performance is from July 1982. The video is a bit wonky at the start, but soon settles down so be patient with it! Shy Boy was the second single to be released from Deep Sea Skiving, reaching #4 in the UK and #83 in the U.S. where the song was titled Shy Boy (Don't It Make You Feel Good). However, the working title was Big Red Motorbike, but this was changed (as were the lyrics) before being recorded. The official video was directed by Chris Cross and Midge Ure who was still in Ultravox at the time. 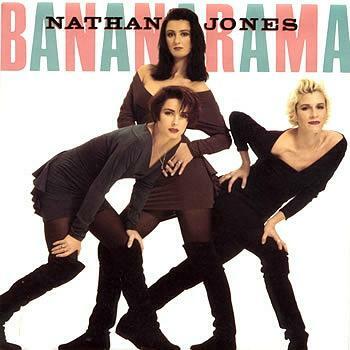 This tune was released as the final single from Bananarama's debut album, peaking at No.5 here in Great Britain, but also reaching #17 in the U.S. dance charts. The song was originally a chart-topper for two weeks in the U.S. during December 1969 for a fictional band called Steam. This was actually by a band called The Chateaus who had already disbanded, but they thought the song was so bad that they didn't want to be identified on the record! Bananarama's self-titled second album was released on Vinyl LP and cassette on 21st April 1984, reaching #16 in the UK and #30 in the U.S. 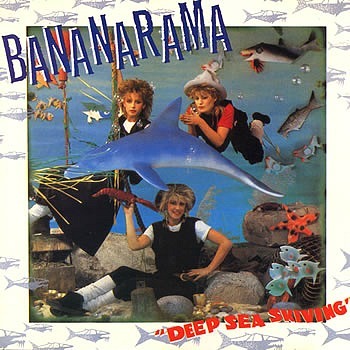 The album was produced by Tony Swain and Steve Jolly who had worked with the girls on some of the songs on Deep Sea Skiving. The original British release contained nine tracks, whilst the U.S. version included an extra track The Wild Life, which was composed for the comedy-drama film of the same name. 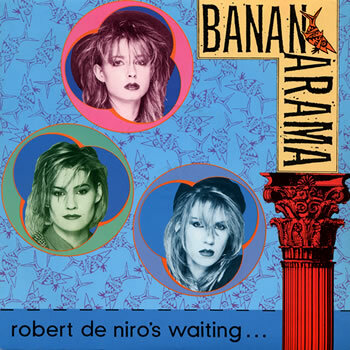 "Robert De Niro's Waiting" was the catchy follow-up to Cruel Summer became Bananarama's biggest hit so far, reaching #3 in the UK, although could only briefly manage #95 on the Billboard Hot 100 in the United States. The single was written by the three girls Sarah Dallin, Siobhan Fahey and Keren Woodward, with help from producers Jolley & Swain. The album version of this track lasted for 7:19, and so, obviously, this single version is less than half the length for the purposes of being played on the radio. Hotline To Heaven was written by the both the producers Steve Jolley and Tony Swain, and the three girls Sara Dallin, Siobhan Fahey and Keren Woodward. The song was a UK only release but only managed to reach #58 in the singles chart. As a pop song I really like it, although it doesn't have such a memorable chorus as their bigger hits, and the lyrics are actually quite dark when you listen to them properly. But compared to some of today's nonsense in the charts, it sounds positively brilliant! Released on 19th October 1984, the song features on the trio's second self-titled studio album. The biggest hit single from the album was Robert De Niro's Waiting. 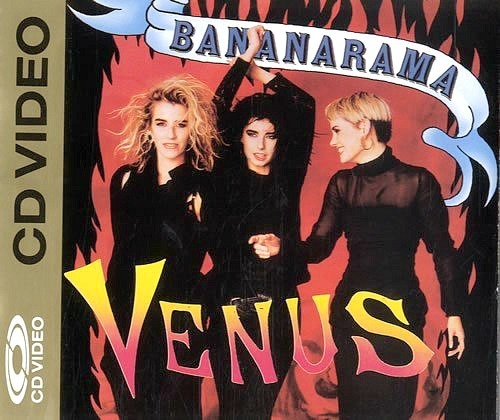 Venus was one of the more memorable songs from the eighties and one of Bananarama's best releases, in my opinion. I wasn't a huge fan of the trio, but this I liked. This was originally a 1969 song by the dutch band Shocking Blue, and was number one in the U.S. and five countries across Europe in 1970. 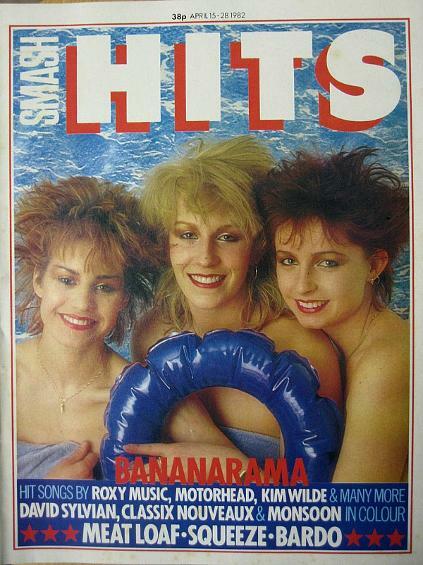 In the 80s, it was Bananarama's turn to cover the song and it returned to number one in the U.S. and topped the charts in six other countries around the world in 1986. Venus was the girls biggest hit from their third album True Confessions, and their first top five hit single since Robert De Niro's Waiting in 1984. 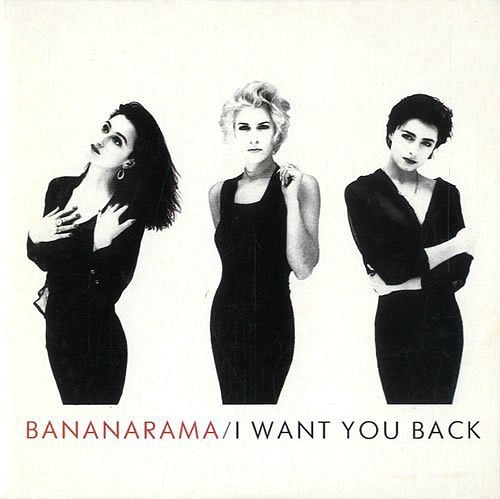 However, Bananarama's rollercoaster ride in the charts continued as the next single release from the album More Than Physical just failed to break the UK Top 40, stalling at #41. 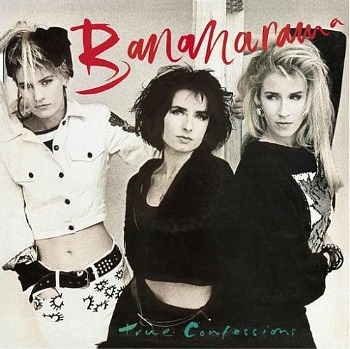 Released on 12th July 1986 on LP and cassette, Bananarama's third studio album, True Confessions, was not very successful here in Britain, stalling at #46 in the album charts. However, it was successful in the U.S. where it reached #15, and also in Canada where it reached #10 and achieved a Platinum certificate. This was the fourth and final single from the fourth studio album Wow! 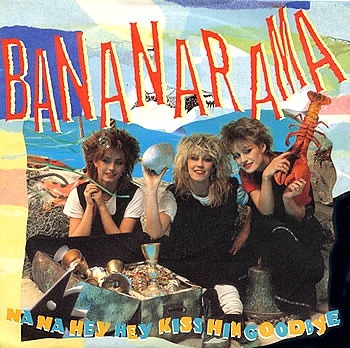 It peaked at #5 in the UK and was never released in the U.S. Co-written by Stock, Aitken and Waterman, this was the first Bananarama single to feature new member Jacquie O'Sullivan, although the original album version still featured Siobhan Fahey. The single version (above) was specially remixed and re-recorded by the other two band members (Sara Dallin and Keren Woodward) to include Jacquie, with Keren playing bass guitar. Nathan Jones was originally a hit for The Supremes back in 1971. 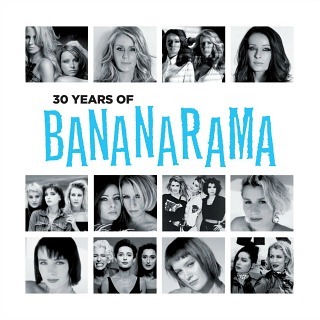 Bananarama recorded two versions, the first one featuring on the 1987 album Wow! After Siobhan Fahey left the group in 1988 - she disagreed with the direction they were taking with Stock Aitken and Waterman as producers - the new trio (featuring Jacquie O' Sullivan as Fahey's replacement) re-recorded the song and released it as a single in November 1988. It reached #15 in the UK singles chart and also featured on Bananarama's Greatest Hits album and The Rainman soundtrack.